Huawei Mate 20 Series Pricing Leaked for China - Playfuldroid! On Oct. 16, Huawei had unveiled the Mate 20 series of smartphones such as Mate 20, Mate 20 Pro, Mate 20X gaming smartphone and Mate 20 Porsche Design. The Chinese manufacturer will be a press event in China on Oct. 26 to announce the Mate 20 series phones for the home market. 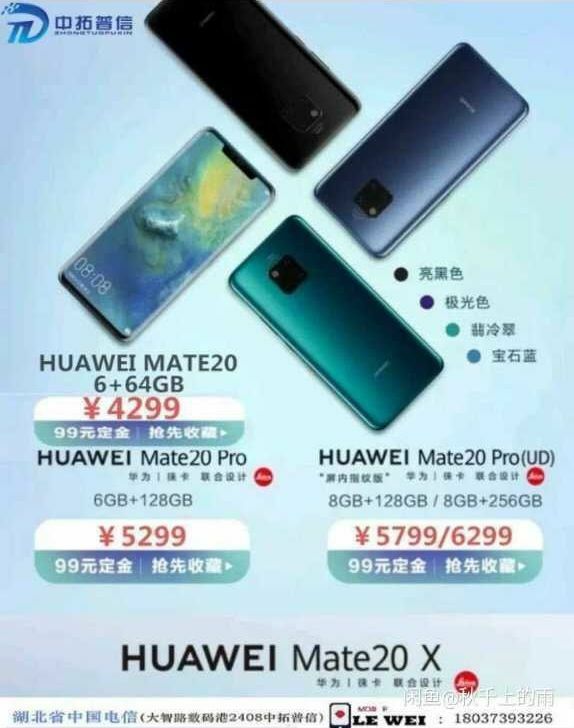 A leaked photo has surfaced on Weibo today that confirms the pricing of the Mate 20 phones for China. The 4 GB RAM + 128 GB storage and the 6 GB RAM + 128 GB storage variants of the Mate 20 Pro have respectively arrived in China for 799 euros ($916) and 849 euros ($979). The Mate 20 Pro that includes 6 GB of RAM and 128 GB carries a price tag of 1,049 euros ($1,203) in Europe. Going by the above shown leaked image, it seems that Huawei may not be launching the Mate 20X and Mate 20 Pro Porsche Design smartphones in China. The new leak reveals that the Mate 20 for China will arrive with 6 GB of RAM and 64 GB of storage and it will be pried at 4,299 Yuan ($619). The Mate 20 Pro includes 6 GB of RAM and 128 GB of storage and it costs 5,299 Yuan ($763). The Mate 20 Pro UD (Under-Display Fingerprint Scanner Edition) is expected to arrive in two models. Its base variant will have 8 GB of RAM and 128 GB of storage and it will be costing 5,799 Yuan ($835). Its higher variant will have 8 GB of RAM and 256 GB of storage. It will be priced at 6,299 Yuan ($907).